I need to test my router (ea6700) for throughput to see if it is capable of routing a gigabit ufb connection. Will simply using two PCs on different subnets (one into lan, one into wan) give a fairly accurate representation or is pppoe throughput performance usually significantly different from TCP/IP? Following on from something Joker97 asked in another thread, which of these would be the best for handling large volumes of concurrent connections (say 30k) without imploding? Thinking in terms of very large scale torrent usage, 100's or 1000's of active torrents each with potentially hundreds of peers. I'm pretty much assuming the Edgerouter Lite? 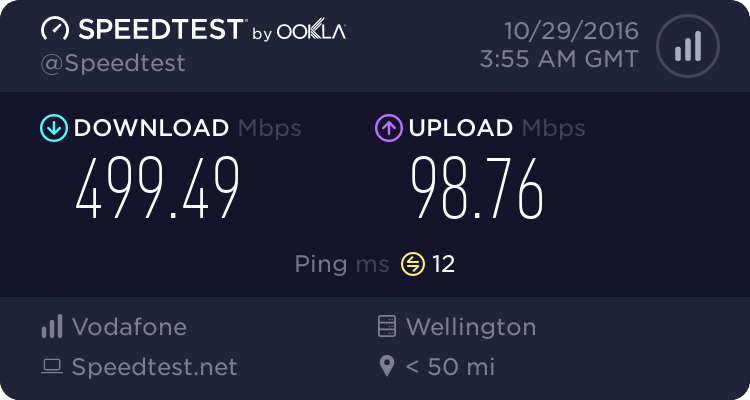 macuser: I need to test my router (ea6700) for throughput to see if it is capable of routing a gigabit ufb connection. Will simply using two PCs on different subnets (one into lan, one into wan) give a fairly accurate representation or is pppoe throughput performance usually significantly different from TCP/IP? iPerf 3 can do this for you. You'll need 2 hosts (one on the inside of the LAN and one on the outside) to make it happen. 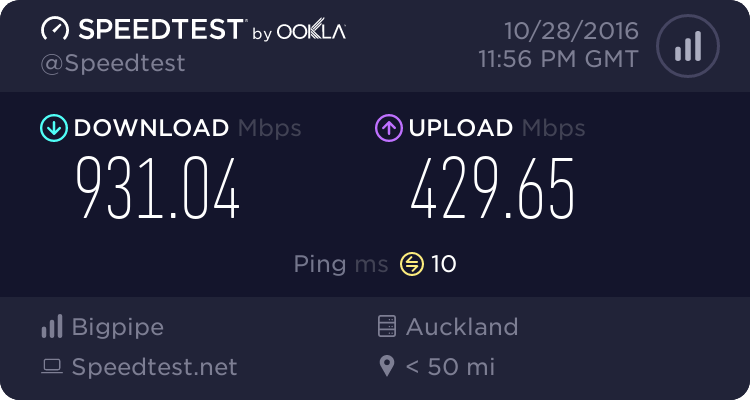 So apart from the download / upload speed dip (really unnoticeable) my connection is unchanged. Hey, thats me!! Was just wondering if I can get the same speed if I use an older modem/router to hook two PCs up to my Spark HG659b, instead of just one (via a single wall plug fed from the new Spark modem/router). With my main PC connected to the wall plug I get 205Mbps. I have tried using both an old Belkin Surf and a HG630b as routers, but get only 80 to 90 Mbps thru them. I expected them to be faster, is this likely to be something in configuration or a hardware limitation? Will continue investigating. HG630b is 100mbit only - you need a new router. First one on my list. Ok. I have found references saying the Belkin should be able to do up to 300Mbps but I haven't seen a definite spec sheet on it yet. Wasn't sure about the Huawei either. So with 2 x Netgear R7000 routers in WiFi bridge mode = 500Mbps - anyone with faster WiFi router option? Cool, they even do Air Fiber X - maybe a Vodafone subsidiary? NF8AC does not have a built in ATA. It's also incredibly important that you upgrade these to the latest firmware that came out late last Month. They're a great device I haven't recommended these for a long time because they've been unusable for many people of the DNS issue in them - it seems a specific combination of traffic or devices (my pick is Apple devices) caused the local DNSmasq (or similar) task on the router to crash meaning you lost DNS until you power cycled them. Interestingly I've not experienced the DNS issue in the 2-odd years since using this router until the last 2 weeks that I've had my iPhone 7+. When in full flight we have 3 iPads, 2 iPhones, an Apple TV, a Chromecast, a wifi printer, a Macbook Pro and an Android tablet all using wifi. Having come off 2 deg contract on fibre with Fritz 7360 am looking at moving over to Big Pipe and upgrading the router to the Big Pipe offering. Question does the HG659 work with DNS4me and does it allow parental controls mainly stopping devices having access to the network between set times. I see the ASUS DSL-AC52U is not on the list, is it still good? I have not tested it however from the Asus site it says it can route 1Gbit so should be fine. The fritzbox is a solid device, I have no idea what michaelmurphy's issue is with it. It's a little expensive, though. Also loving the passive-aggressive dig at me re: TR-069. Thanks, mate. All my experiences with it involved rubbish WiFi and other issues that have made me disregard it. I understand some people like it but for me it is an ISP provided router that is great for your home user but not one I recommend to go out and buy. For your average home user I do see the HG659 with the BigPipe firmware to be a much better and cheaper option. It is personal preference.